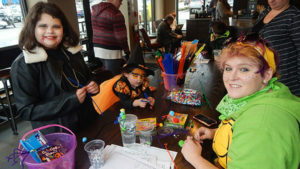 Shrewsbury – Cloudy skies and chilly temperature didn’t put a damper on the Lakeway Commons’ first annual Trick or Treat event held Oct. 28. In fact, it only added to the spooky atmosphere of the afternoon. 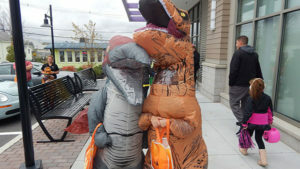 There were super heroes, pumpkins, witches, skeletons and assorted animal costumes – even a few dinosaurs – and so much more. 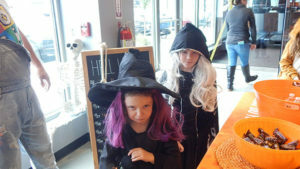 The event, which was free of charge, featured treats galore as well as family-friendly activities at each of the participating businesses including face painting, costume contests, games, arts and crafts, and wheels of fortune. Atlantic Poke had a musician for all to enjoy. 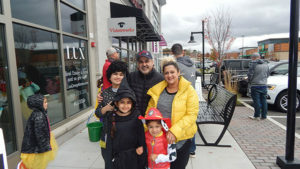 Matt Armenti, relationship branch manager for UniBank, and one of the event organizers, said that the event was very busy all afternoon. He is confident, he said, that the plaza’s businesses will hold the event again next year. He also shared that they are thinking of doing something around the December holidays as well, such as a tree lighting event. Participating businesses include: Atlantic Poke, Burtons Grill, Club Pilates, Especially for Pets, Shrewsbury Dentistry, Skin MD, Starbucks, Lux Group, Jenny Boston, Lunchbox Wax, Massage Envy, Orangetheory Fitness, Tavern in the Square, Lash Lounge, UniBank, Whole Foods, and Qdoba. Lakeway Commons is located on Route 9 West in Shrewsbury. 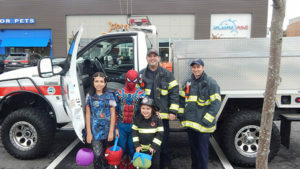 (l to r) Casey Lopez, 10, Samuel Lopez, 11, and Lucianna Lopez, 5, with Shrewsbury Firefighters Rory Ahern and Brendan Palumbo. 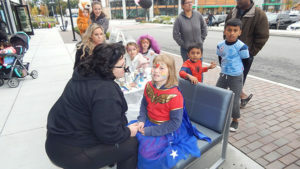 (l to r) Nora Miller, 8, gets her face painted as other kids look on. 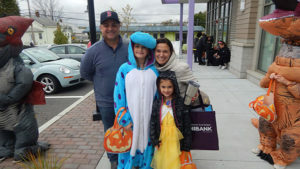 Parents Anthony and Lisa D’Elia with their children, Emma, 11, and Gianna, 6. (back) Sam Nakle and Alanna Shahi with Tara Nakle, 11, Nava Nakle, 8, and Ashton Shahi, 4.